How does one get a ticket on that ride?? Seriously. Without enlisting. I'm with you! That looks *awesome*. That is so intense! I like roller coasters but that looks scary. E-ticket ride! That brings back memories of the ticket books at Disneyland. Those E-tickets were the best in the book for the choicest rides. I still have a couple of E-tickets. Disneyland was something else then. 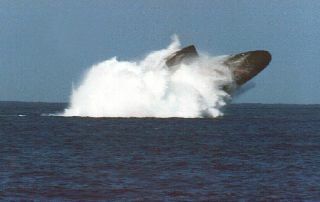 That shot of the sub exploding from the water is awesome. Wow not sure if I would like it or not but yet it does sound exhilarating. I never knew there was such a procedure.